The analysis of the UV atmospheric emissions arising from Mars' upper atmosphere has been used since the Mariner missions in the 60s to obtain information about this region, very difficult to sound by other means. On the dayside of Mars, two of the most prominent emission systems, the CO Cameron bands and the CO2+ UV doublet, are originated by the interaction of the solar radiation with CO2, the dominant species on Mars. The altitude variation of these emissions has long been used to derive atmospheric temperatures in the thermosphere. In this talk we will summarize our recent analysis of observations performed by the instrument SPICAM on the Mars Express mission on the dayside of the planet, and by the instrument IUVS on board MAVEN on the nightside of the planet. 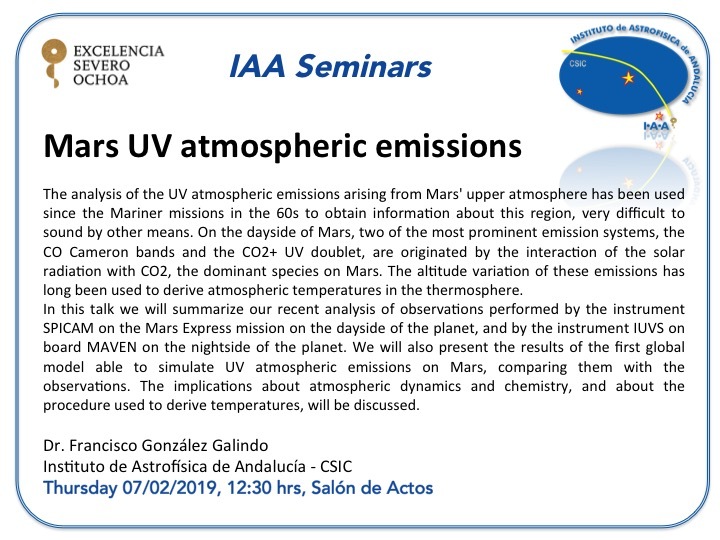 We will also present the results of the first global model able to simulate UV atmospheric emissions on Mars, comparing them with the observations. The implications about atmospheric dynamics and chemistry, and about the procedure used to derive temperatures, will be discussed.